The Altai Mountains form the tallest mountain range in southern Siberia and are separated by deep river valleys and vast intermountain hollows. The Altai stretches into Central Asia and crosses four state borders: Russia, Mongolia, China and Kazakhstan. The Altai Mountains (3700 kilometers from Moscow) have a fascinating look to them during all seasons except, perhaps late fall when bad weather, which is common here, gets worse due to heavy rains and strong winds. The weather in the Altai Mountains can contrast greatly even in March, and while you will feel relaxed wearing a t-shirt at the bottom, higher in the mountains a full set of winter clothes will be necessary. Some areas, especially those high up, never get rid of their snow. However, experiencing the changing of seasons from winter into spring in the Altai Mountains is a thrilling experience. The Altai Mountains is the ultimate destination for those who love deep snow and active vacations. The Altai Mountains are not for the meekest of travelers, but for those looking for adventure they are a great discovery. 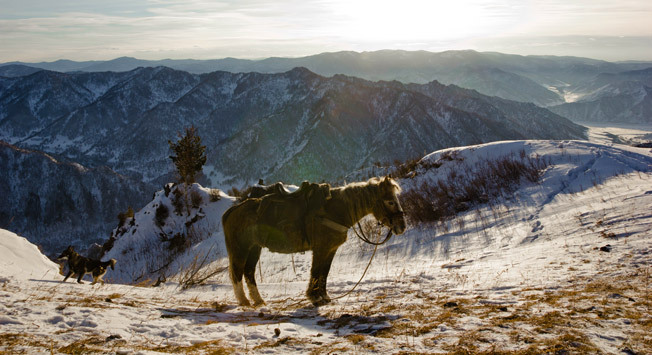 There are numerous ways to explore the area, but the greatest alternative for trekking or snowmobiles are a special breed of Altai horses that are curly-haired, calm-tempered, low-maintenance and trustworthy even on the most difficult sections of the mountains. We have selected three different ideas for making the most of your mountain adventures in Altai. Winter tours to Mount Belukha, the “Queen of Altai,” which resembles the outline of a woman lying down, are a real adventure. As local legend has it, 100 years ago man was not even supposed to approach the foot of Belukha, and “the queen” was known for taking revenge on such acts of disobedience. Only shamans gathered at Belukha for rituals in days defined by the position of the stars. Winter ski tours to Belukha last 10 days in groups of 6-10 persons. Contact the local tour operator below for the dates of the trip. The total price depends on the number of participants. There’s a transfer for tourists from the airport in Barnaul (the capital city of the Altai Territory) to the first stop in Tyungur village (750 kilometers from Barnaul), which is a good introduction to the amazing landscapes and climatic zones of Altai. Tourists spend three days skiing and hiking, then will pass the Kuzuyak mountain crossing (1513 meters high) and visit “centers of energy” (mysterious natural monuments of Altai) as well as Ak-Kem mountain lake, which is located over 2,000 meters above sea level. Overnight stops are organized in well-heated winter camps. The road back to Tyungur village takes three days, with an option to pass Karatyurek mountain crossing (3,060 meters high). The tour takes you back to Barnaul airport. For this tour, horseback-riding experience is a plus, but is not necessary. Being ready for active hiking, however, is a must. This tour is a real adventure that begins with a road trip from the village of Chemal, an alpine resort (341 kilometers from Barnaul). Tourists are supposed to reach Chemal themselves, but they will be transferred to the base camp on the banks of the Edikhta River. Horseback riding at the heart of the Altai Mountains in the picturesque Chemalsky district is a popular option among active travelers. The base camp, a huge wooden chalet, is located in the cozy Edikhta River valley. The chalet is warm and makes guests feel comfortable after a hike in the mountains. However, it maintains a rustic charm with wooden bunk beds and sleeping bags. Every day, beginning in the morning and lasting until lunchtime or later, you will go horseback riding in all directions from the base camp. Each trail has its own complexity and breathtaking views of nature. But the activities don’t end when it gets dark. After dinner the tour guides organize special entertainment programs that continue late into the night and end with fireworks. These programs are optional, of course. There’s also a three-day long program for tourists who come to visit Altai in March. In addition to horseback riding, downhill sledding is still possible. All signs of winter are still visible in spring with snow still covering the ground, but the sun shines bright and makes spending more time outdoors possible for tourists. Duration of winter seasonal horseback-riding tour: five days. Price: from 16,000 rubles ($260). Duration of Christmas horseback-riding tour: four days. Price: from 15,000 rubles ($245). This tour is available during in winter or spring and has special options by request. This tour is more comfortable than the other options. The price starts at 38,000 rubles ($623) and depends on the level of accommodations, meal service and rent of mountain skiing equipment desired. The tour includes all sorts of winter fun, such as skiing and snow tubing in the mountains, horseback riding, as well as excursions to several nearby towns. Tourists will also visit the village of Chemal, where an ancient hermitage is located on an island in the middle of the Katun River. In the early 20th century a well-known local hermit, Macarius, lived there. Now the hermitage belongs to a monastery. Guided tours of the hermitage are available. The island is connected via a suspension bridge, which stretches high above the river. The details of your transfer should be discussed in advance. Large tour operators can meet tourists in Barnaul, Gorno-Altaisk or Biysk for those who arrive by plane (Barnaul, Gorno-Altaisk) or train (Biysk). Base camps of family operated tour agencies are usually located on their own property and can usually be reached by bus or taxi. Both bus and road services in Altai are well developed. Travel time depends on which tour operator you choose and can take 4-10 hours. However, on your long way through Chuisky or Chemalsky tract you will be treated to views of the Katun River, which is free of ice in winter and surrounded by breathtakingly beautiful landscapes. There are souvenir shops and cafes with hearty local cuisine along the way.